Building Resilience - ANGELA M. HOUSAND, PH.D.
EduFest Building Resilience from Angela Housand, Ph.D.
Find pictures on the Internet that represent the strengths, weaknesses, opportunities, and threats in your life (be sure not to infringe on copyright). 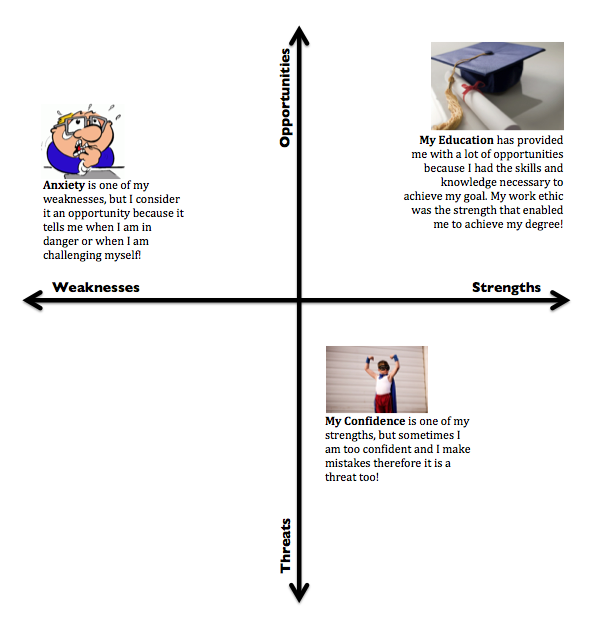 Make a copy of the SWOT Analysis Google Drawing or Google Slide (the slide version works best with iPad). Systematic Risk-Taking from Angela Housand, Ph.D. Ask students what strategies they came up with to engage the rist. Students do not have to share specifics about the risk they were working on engaging; just the ideas they got about the specific strategies. Collect strategies until you are hearing the same thing multiple times. Identify similarities across strategies (usually there are 5-9 strategies once you take out repeats or overly similar ideas and combine them into a single idea). Write the strategies for students to see. Help students see how those same strategies could be applied in multiple situations and in multiple categories of risk. Neihart, M. (1999). Systematic risk-taking. Roeper Review.